There is a long tradition of artists as organizers. Artists participate in social justice through their creativity communicating demands and goals with visual works, with their labor in producing multiples, and through creating consumable items for fundraising. We Are All in This Together illustrates the moments when artists have rolled up their sleeves to do the dirty work of organizing. More than providing political commentary or personal response to topical events, many cultural workers have used their trade and skillset in solidarity with social, economic and environmental struggles. 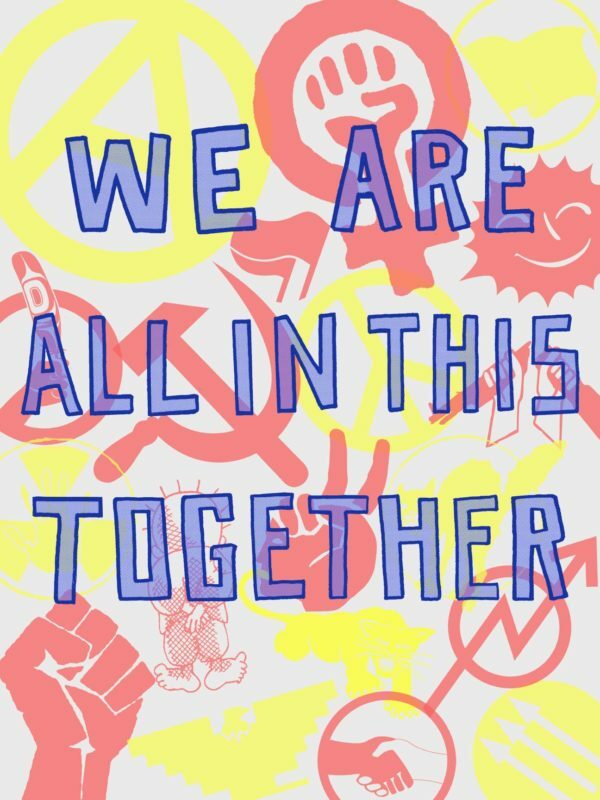 This exhibit will use Justseeds prints that were produced in solidarity with recent struggles, including Standing Rock, the Wisconsin uprising, and BDS, along with ephemera produced by those social movements. This exhibition is organized by Interference Archive’s Amber Hickey, Amy Roberts, Bonnie Gordon, Melissa Sions, Nora Almeida and Kevin Caplicki Interference Archive co-founder and member of Justseeds. Interference Archive is an all-volunteer, grassroots archive of social movement cultural ephemera based in Brooklyn, NY. Its mission is to explore the relationship between cultural production and social movements. This work manifests in an open-stacks archival collection, publications, a study center, and public programs including exhibitions, workshops, educational visits, talks, and screenings, all of which encourage critical and creative engagement with the rich history of how people have organized to transform and improve their lives.